Top quality, A-Grade, natural, terminated Imperial Topaz crystals from Brazil, with beautiful deep, bright colour - better than they appear in the photo. Price is for ONE piece. Also known as Golden Topaz, this is one of the most sought after types of Topaz. Imperial Topaz links the highest traits of the Solar Plexus and Heart chakras. More specifically, it helps merge our will and power of manifestation from the Solar Plexus to our expression of love and emotional connection with the Divine from the Heart chakra. This combination enhances our conscious powers of manifestation and co-creation with the Universe; bringing our actions into alignment with the greatest good. It also helps Spirit overcome Ego. In other words, helps guide us to find what is right for us, which is not always what we want, but what our soul knows we need. 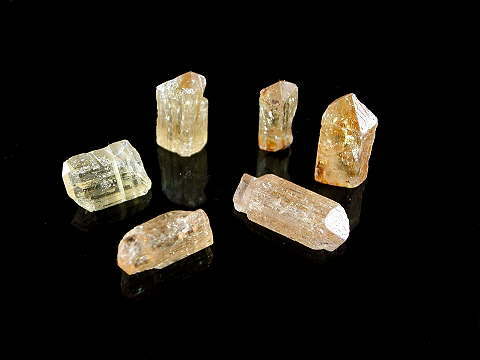 Imperial Topaz also has a higher vibration. It opens our 7th, 8th and 9th chakras to align us to the true purpose of our spirit; illuminating our path and true soul purpose. It helps us become co-creator in this process; powerfully awakening latent spiritual gifts, whilst giving us the confidence to trust these new talents. Physically Imperial Topaz can help energise weak energy systems; those suffering from chronic and debilitating conditions such as M.E. It also links energetically to the heart, lungs, circulatory and digestive systems as well as to the stomach, liver and gall bladder. Price is for ONE piece. All are of equal quality and bright colour. The colour is more consistent than shows in the photo.